Positing that there’s a secret battle in the forest between life and decay, the new animated film Epic proceeds to zoom into a world of tiny forest Samurai (called the Leaf-Men) who ride hummingbirds and fight against the forces of darkness and rot, epitomized by gray, scaly, gnarly creatures called the Boggens. Along comes ordinary-size human M.K. 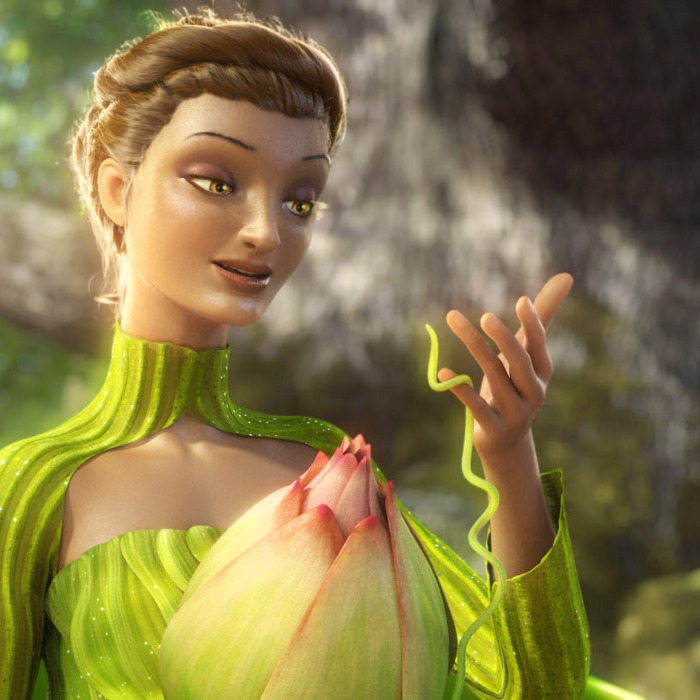 (voiced by Amanda Seyfried), newly arrived at the woodland home of her nutty scientist father (voiced by Jason Sudeikis) and who lands in this magic tiny forest people world just as the beautiful and ethereal Queen Tara (Beyoncé) is dying. Given a magic flower pod by the queen, M.K. joins a veteran Leaf warrior named Ronin (Colin Farrell) and a brash young rebel named Nod (Josh Hutcherson) as they seek to preserve the pod, which will help them crown their new queen if they allow it to bloom in the light of the moon during a Summer Solst … oh, forget it, it’s too elaborate to explain here. For a movie that’s so generic, Epic sure does throw a lot of contrived mythology at us. Epic will one day live on someone’s alphabetized movie shelf right next to the 2007 spoof Epic Movie, and that rather undiscriminating consumer may well wonder which of the two is more derivative. This one was co-written and executive-produced (and production-designed) by the award-winning children’s author and illustrator William Joyce, who also wrote the charming and modestly fanciful book The Leaf Men and the Brave Good Bugs, from which the story was adapted. His work and designs were also behind last year’s animated film Rise of the Guardians, which, too, overzealously synthesized well-worn children’s themes and folk archetypes into a movie-friendly action tale. But Rise of the Guardians had inventiveness, energy, and rapid-fire wit — all elements that Epic sorely lacks. At times, Epic seems to be trying to mimic Avatar, both in its action sequences and its attempts to tap into a we’re-all-connected-through-the-forest mysticism. There’s even a kind of Tree of Souls/Tree of Voices type place, where memories are stored. But the connection feels more generic than heartfelt, the need to scale everything up more dutiful than ambitious. (Whatever you may think of Avatar, it at least had a mad conviction that justified its awesome size and reach.) There is one genuinely delightful sequence, when the miniaturized M.K. and her companions find themselves trapped in her dad’s laboratory: Her beloved dog suddenly becomes a lumbering, terrifying monster, and the little people’s interactions with common household phenomena like lint and static cling produce fun results. But the charm of these scenes reminds us of the wasted opportunity the rest of the film represents. For all its attempts at wonder and spectacle and play, Epic is mostly a slog.